Originally designed by Francis Johnston who lived in Drogheda from 1786 to 1793 while working on a commission from Primate Robinson. This building today houses Drogheda’s council offices. It is built of limestone ashlar and provides an excellent example of Johnston’s very symmetrical style in its elegant simplicity. It was designed as an open space with arcades and doric columns on four sides and offices on the Fair Street side. The arcades have been filled in as office accommodation. The long Fair Street façade is terminated by two pedimented pavilions. 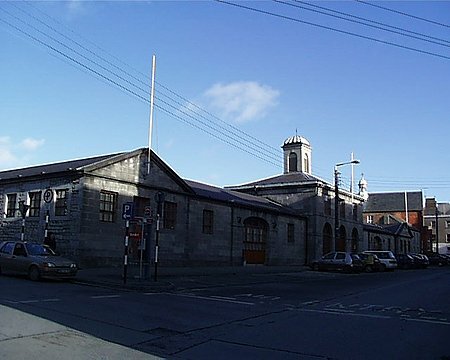 The building is surmounted by a green cupola and is topped by a cockerel weathervane with Drogheda’s Star and Crescent as a crest.